Zimmer ZWave Pro a revolutionary, non-surgical treatment that can effectively reduce the appearance of cellulite. It’s most effective on some of the toughest problem areas, including the thighs, stomach, and buttocks. ZWave PRO delivers energy shockwaves into the area, disrupting the structure of the fatty tissue for smoother, less dimpled skin. This innovative procedure is designed to be comfortable, quick, and affordable. No more extensive downtime or recovery typical of more invasive methods. Am I the right candidate for ZWave? ZWave is a safe, non­invasive cellulite treatment, so there really are no safety concerns that would restrict a patient from being a viable treatment candidate. However, ideal candidates should be within a healthy weight range and should have realistic results of treatment. Following a complete series of ZWave treatments, patients can expect to see a reduction in the appearance of cellulite and an improvement in skin firmness. ZWave treatment can be effective in treating mild to moderate degrees of cellulite on the arms, thighs, buttocks, hips, or abdomen. It is important to note, however, that ZWave treatment is not intended for weight loss, and is not a weight loss solution..
ZWave treatment is a quick and painless procedure for patients. Typically, a treatment session lasts no more than 20­-30 minutes. During this time the ZWave device is passed over the treatment area, where it will deliver high­-energy radial acoustic waves. This energy addresses the problem of cellulite by improving blood circulation in the treatment area, stimulating collagen formation, encouraging lymphatic drainage, and improving skin elasticity and firmness. We recommend a series of 10 treatment sessions, with treatments scheduled once or twice a week. After the series of cellulite treatments, the desired results will begin to appear. If cellulite is your primary concern, you’re likely to find the results they desire from ZWave treatment alone. However, if you wish to not only eliminate cellulite, but also reshape the body to improve body contours, then additional treatment may be necessary. 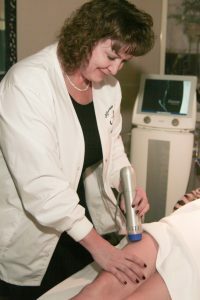 ZWave treatment is a great complement to any of our body contouring procedures that help patients sculpt and tone the body. When combined, these treatments can enhance the figure while also smoothing and tightening the skin to eliminate the appearance of cellulite. Copyright © 2019 · Affordable Laser, LLC.